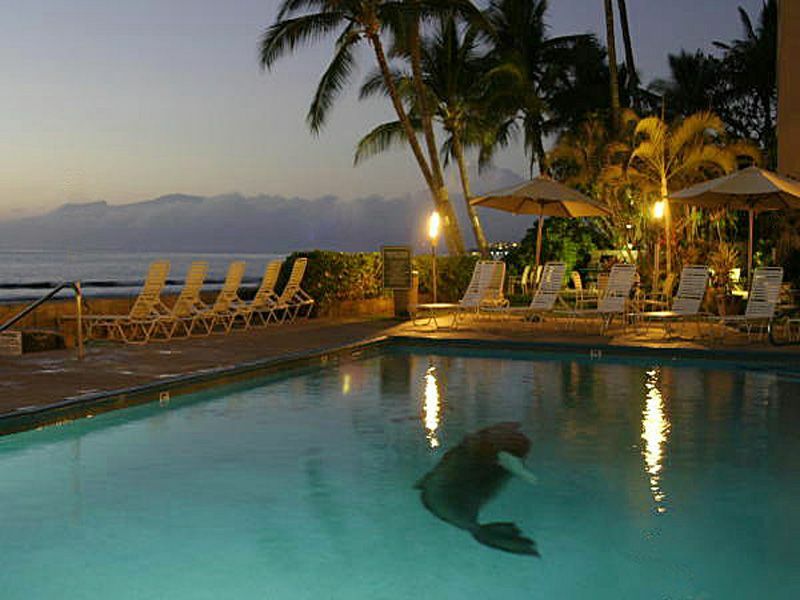 Lahaina Roads is an intimate, local, Lahaina-based resort that is over 60% owner-occupied. Completely remodeled, our condo (#308) offers a perfectly relaxing oceanfront home base for enjoying the pleasures of West Maui - Ka'anapali beach, golfing art galleries and historic Lahaina town. Lahaina Roads is one of 2 oceanfront resorts in Lahaina Town. It is a small resort, and by far the most home-like, with lots of owner occupants, in a small residential area of north Lahaina. You can walk most everywhere (Safeway, Ka'anapali beaches, the Cannery Mall) or take the free shopping shuttle all over the west side. In car-intensive Maui, this resort makes it so easy, you might find you almost don't want a car - you could just relax on your lanai and watch the green sea turtle activity until the sun sets lingeringly over Lanai, then stroll down to Aloha Mixed Plate for dinner and listen to the music of the Old Lahaina Luau wafting over from next door. The condo was nice enough, the pool was great. Owner was very accommodating. The bathtub is not very accommodating for older folks or anyone with fear of falling. However the owner did go out an buy a rubber mat for the tub, that helped. The manager was nice and helpful. Absolutely beautiful view and nice accommodations. You can't beat the view from this property !. The pool is great, the Condo has everything you need. Jan is great to work with and the person on site, Mike, was very helpful. Very close to Safeway for shopping needs. We would recommend this stie to our friends and hope to stay there again someday. Thank you so much for the great review! You were such a great guest - I look forward to hosting you again. View,Property and Owner, these are amazing! No need the comment. If you stay there, you will understand all! Thank you! I appreciate it. You were a great guest too. Cozy with a great view. The manager, Jan, was great. Very friendly and helpful. The unit itself was just right for two people and for the price was quite nice. The only thing of any significance that was disappointing was that the air conditioner did not work and the most effective floor fan for keeping us cool at night in the bedroom they provided was so unbalanced and noisy as to be intolerable above the lowest speed setting and very bad at the lowest setting. It shook and rattled to the point of seemingly coming apart at the seams. Other than the air conditioning and one poor quality fan it was a very pleasant stay. It had no beach access but the small waves against the rocky shallows and sea wall 25 feet from the building was a soothing sound to listen to at night. If you are looking for a inexpensive base station to explore Maui this unit is perfect. Close to grocery and sundries stores and less than 2 miles from the main downtown Lahaina area. Several eateries within 1/4 mile. Aloha John - thank you for your comments. I own the condo! Yes, I am sorry the A/C broke during your stay. I had my A/C guy make an emergency service call. Unfortunately, the parts needed to repair it had to be ordered in from off-island and the repair could not be effected during your stay. I did bring you another fan and would have been happy to replace the one you are referring to. I did not know it was a continuing problem - had I known, I would certainly have replaced it right away! I did provide you with 3 fans additional to the ceiling fans, and you indicated this was OK. I also gave you a significant rebate on the rent you paid, which you indicated was satisfactory. But, again, I am sorry the A/C did not work for you and that I was not able have it repaired for you. Rest assured, this won't be an issue in the future, as I am replacing the whole A/C system, and the new one is warrantied for 12 years. Wonderful real world charm, with all of the amenities you expect. A wonderful condo in an exceptional community and location. Jan's condo has everything one could want. It is very well stocked in the kitchen, bathroom, and all rooms. The bed is very comfortable and there's a large dresser and closet so you can unpack and feel at home. The recliner in the living room is the greatest! The furniture on the balcony and in the living and dining are very comfortable. I had questions about how to work a couple of things in the condo and Jan responded immediately. She was very helpful. The community as a whole is well kept. There's a lovely pool area, and garden. The guests who stay there are the kind of people who enjoy the quiet beauty of the natural surroundings. Being right at the ocean is a huge plus! This is my second stay in the community and I would come back, as many do. The BBQ area is great, and the community kitchen area nearby is very useful. The manager was very helpful, and came to my aid when I had an issue with my rental car. I highly recommend both the condo and the community.